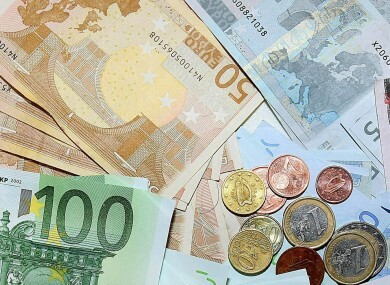 The country’s political parties were paid €12.6m from the State coffers last year, according to figures released by the State’s ethics watchdog. 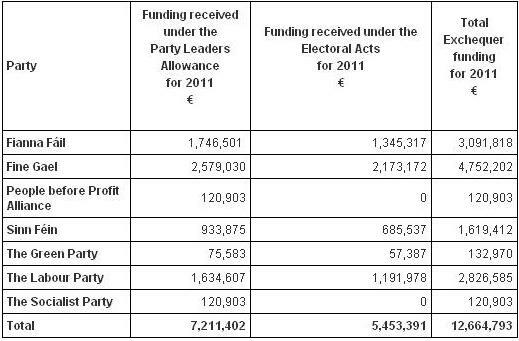 The four main parties – Fine Gael, Fianna Fail, Sinn Fein and the Labour Party – received combined funding of €5.5m. The Standards in Public Office Commission (SIPO) details every year the level of funding paid to parties and their politicians under the Electoral Acts. While the allowances can be used to cover the costs of their political duties, under the rules, an allowance paid under this section can not be used for, or to recoup, election or poll expenses incurred for the purposes of any election or referendum. Of the political parties in receipt of the funding, Fine Gael received €2.28m – the largest single sum – due to the number of TDs and senators in Taoiseach Enda Kenny’s party. The Labour Party received €1.29m. Fianna Fail received €1.17m, according to the figures, followed by Sinn Fein which got €720,000 in funding. The SIPO figures also detail the extra €7.117m in funding paid to party leaders which is used for staff costs, research and office expenses. The details released yesterday also show that independent TDs received €563,866 through what is known as the leaders allowance. Independent senators received €249,130 in State funding in 2014. The payment of the leaders allowance to independent TDs has been a constant topic of controversy in Dail debates. Independent TDs have argued that they operate without the backing of large party structures and the money is badly needed. Analysis by independent TD Catherine Murphy reveals that the 145 deputies belonging to Fine Gael, Labour, Fianna Fail and Sinn Fein will each cost on average 52pc more per year than the Dail’s Technical Group members. From 2016, SIPO will require all parties to publish national audited accounts. The decision came after Government ministers pledged greater transparency and accountability over funding. It is currently carrying out a public consultation process on new rules requiring greater transparency on how the party leaders allowance is spent. The allowance will be renamed the parliamentary activity allowance, as independent TDs will also be required to report on how they spend it. In wake of European ruling will it be illegal to slap a child? Slapping is widely practised, though it’s been declining sharply over recent years. It’s highly unlikely – despite a ruling by the Council of Europe on Wednesday – that Ireland’s laws which permit the slapping of children are a violation of children’s rights. While legislation which allowed parents use force against their children was repealed in Ireland almost 15 years ago, the defence of “reasonable chastisement” still exists in common law for parents or child carers. The council found this defence was a violation of the charter whose signatories promise “to protect children and young persons against negligence, violence or exploitation”. Even though Ireland is out of kilter with much of the rest of Europe, the Government is fearful of wading into an issue where public opinion is divided. That’s why, for much of the past decade, it has tried to fudge the issue by claiming a ban is “under review”. The Government’s response on Wednesday was strangely familiar: it announced plans for a new review of whether the defence of reasonable chastisement should be maintained in law. It insists there are plenty of other laws which outlaw the assault or physical harm of children, such as the Child Care Act and the Criminal Justice Act, along with rules and guidelines. It did, however, throw a bone to the council by pledging to explicitly ban the smacking of children in foster or residential care through new regulations. If an outright ban were to be introduced, it could have major repercussions. Slapping is widely practised, though it’s been declining sharply over recent years. The Growing Up in Ireland study of three-year-olds found up to 45 per cent of their primary caregivers had previously smacked them, for example. In theory, the State is now obliged to introduce a clear ban on slapping – or “corporal punishment” in the words of the council – on foot of this week’s ruling. But the council issued a similar ruling on Ireland’s laissez-faire stance on slapping just over a decade ago – and little action followed. In reality, Ireland only faces “political peer pressure” from other member states who have introduced bans on slapping. T he real pressure will come from children’s campaigners such as the Children’s Rights Alliance. The Government, meanwhile, seems more than content to keep the issue “under review”. 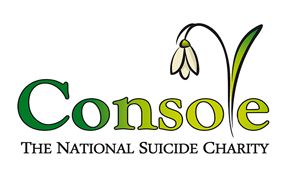 Irish women are being urged to start the conversation on suicide by supporting Console’s national awareness campaign. Sabina Higgins, wife of President Michael D Higgins, joined with the Taoiseach’s wife Fionnuala Kenny to launch the Cosy Up To Console campaign in Swinford, Co Mayo, yesterday. “Life is our most precious possession and privilege and death our greatest fear and dread. Console’s work shines a light of hope for those who are struggling with darkness and sadness,” said Mrs Higgins. Console is asking mothers, grandmothers, sisters and friends to get the nation talking about issues surrounding suicide. The campaign is the brainchild of psychotherapist Anne Lynch, manager of the Console Centre in Swinford. “We have got to get people talking about suicide and what can be done to help those who may be in crisis, a chat over a cuppa is a good way to start that conversation,” said Ms Lynch, who decided to combine knitting sessions with tea and talks. “We are asking people across the country to get chatting and knitting tea cosies over the next few months. The plan is to sell Console tea cosies as gifts for Christmas. Not only will they raise funds for the organisation, they will also raise awareness as they will get people talking,” said Ms Lynch. Fionnuala Kenny added her voice to the call, saying: “I am very happy to support this initiative by Console who do fantastic work in the area of suicide prevention and support for people in distress”. The charity offers counselling services and 24-hour helpline support to people in crisis or affected by suicide. Console can be reached on freephone 1800 247 247 and a list of its resources can be found on http://www.console.ie. Now you can travel around the world and live in a luxurious hotel at the same time, thanks to a new innovative egg-shaped eco pod. 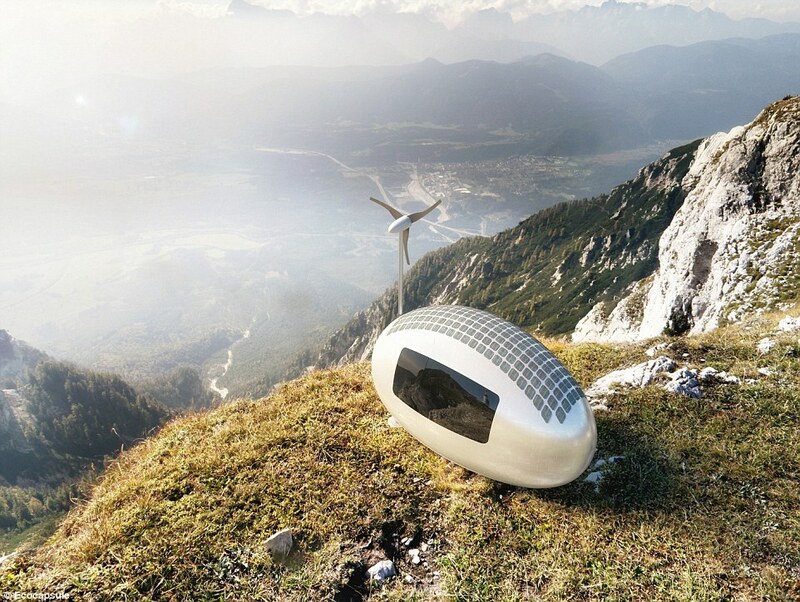 A creation by Slovakian firm Nice Architects, the UFO style mini-pod, which is powered solely by solar and wind energy, features an energy-efficient shape and includes its own shower and toilet, sleeping area for two, and kitchenette, reported the Daily Star. The Ecocapsule’s first look will be offered at the Pioneers Festival in Vienna, Austria, on May 28 and 29, and it can be pre-ordered by the end of 2015. The capsule features membrane water filters to purify 99.99 percent of bacteria, rendering any natural water source suitable for drinking. Nice Architects stated “strict management of energy resources” as the reason for their successful survival strategy. Take a moment out of your too-busy, over-packed day to answer this simple question: if you had to sum up how you feel about stress, which statement would be more accurate? a) Stress is harmful and should be avoided, reduced and managed. b) Stress is helpful and should be accepted, utilised and embraced. American health psychologist and stress-has-an-upside advocate Dr Kelly McGonigal admits that, like most harried members of the modern world, she was inclined towards ‘a’. Stress, she told her clients for over a decade, was public enemy number one; a toxic silent killer that was to blame for everything from the common cold to heart disease, premature ageing, depression, and lots more besides. However, seven years ago, Dr McGonigal changed her tune after making a startling discovery — stress is harmful only if you believe it to be so, according to ground-breaking research. She swallowed her pride and admitted that what she had been telling people was wrong. People sat up and took notice. In 2010, Forbes named her one of the 20 most inspiring women to follow on Twitter. Three years later, she did a TED talk explaining how to make stress your friend. An impressive eight million people have already listened to it. Now, the Stanford University lecturer hopes to reach even more people with her new book, an inspiring read that charts the new science of stress. But why should we change our minds about stress? The research which stopped Kelly McGonigal in her tracks was a study that followed 30,000 American adults over an eight-year period, from 1998 to 2006. It asked them how much stress they had experienced in the last year and if they thought it harmful to health. But — and the story of stress is a story of those significant ‘buts’ — researchers at the University of Wisconsin-Madison found that those who also felt high levels of stress but didn’t believe it to be harmful were not only alive, but thriving. Researchers looked at death rates among survey respondents and found those who felt stress — and, here’s the clincher, felt negatively about it — were much more likely to fall ill, and even die. However, those with a positive attitude to stress were least affected by it, even less so than those who said they felt almost no stress. Since the game-changing research, study after study has found that stress isn’t always bad. However, to see for herself Kelly McGonigal went to the Behavioural Research Lab at Columbia University in New York and, under the supervision of psychologist Alia Crum, strapped herself into what she describes as ‘torture equipment’ to assess her physical reactions to a stressful mock interview. Like those before her, Dr McGonigal was shown one of two videos: the first spelled out the negative impact of stress, while the second explained how stress, if embraced, could enhance your performance. She was shown the stress-is-enhancing video before being put through her paces by interviewers who were instructed to criticise her no matter what she said. “One finding blew me away,” she says. “The saliva I had drooled into the test tube provided a sample of two stress hormones: cortisol and dehydroepiandrosterone (DHEA). We need both of these hormones, but the ratio between the two can influence how they affect health in the long term: cortisol can impair the immune system and lead to depression but DHEA can reduce the risk of anxiety, heart-disease and other stress-related illnesses. Psychologist Alia Crum found that people who saw the stress-is-good video still produced the same amount of cortisol but changing their perception of stress helped them to produce more DHEA which, in turn, helped them to offset the negative effects of stress. It follows, Dr McGonigal says , how you view stress influences the way it affects your body. For instance, she says, instead of thinking of the pounding heart, tense muscles and churning stomach as negative reactions, it helps to think that this is your body becoming energised and preparing to meet the challenge. That’s all very well but how do you cope with the sweating palms and dry mouth when you have to make an important presentation at work? When Harvard Business School professor Alison Wood Brooks asked hundreds of people that question, 91% said the best thing to do was to calm down. She decided to experiment. Some were told to be calm while others were told to embrace the anxiety and feel excited and alive. The ‘excited and alive’ group performed better, according to the audience who said they were more persuasive, confident and competent. Research on stress has uncovered another startling finding — a 2012 study at the University of Freiburg suggests that stress makes you more social; it helps you to connect with others. When stressed, the pituitary gland produces the happy hormone oxytocin. It’s been dubbed the ‘cuddle hormone’ because it fine-tunes the brain’s social instincts and prompts you to surround yourself with people who care. “I find this amazing, that your stress response has a built-in mechanism for stress resilience — and that mechanism is human connection,” Dr McGonigal says. She quotes another US study, conducted by researchers at the University at Buffalo over three years. It asked 1,000 adults (aged between 34 and 93) two questions: how much stress they had experienced in the last year and how much time they had spent helping neighbours. It found that every major stressful experience increased the risk of dying by 30%. But — and here’s that ‘but’ again — people who spent time caring for others did not suffer the harmful effects of stress. There’s more to report on the upside of stress. It can give meaning to life. In 2005-6, researchers Gallup World Poll asked people from 121 countries about their experience of stress. Those who felt a great deal of stress also reported being more satisfied with their health, work standard of living, and community. Perhaps the worst thing that a person can believe about stress is that you can avoid it. Dr McGonigal explains: “I’ve come to believe that the most harmful belief is that stress can be avoided. We’re clinging to this — understandably attractive — myth that some day our lives could be stress-free if only we take the right pill, or buy the right bubble bath, or finally make time to meditate. The secret, then, is to do what seems counterintuitive: embrace your stress and learn how to harness it to become happier, healthier and more successful. Tackling obesity is a major priority the Government has said, as a report warns that one in five cancer deaths is caused by it. The alert came at the world’s biggest conference on cancer, which sounded the warning that obesity is killing tens of thousands of people a year in Britain – and the West is about to see it replace tobacco as the leading preventable cause of the disease, according to The Times. Jennifer Ligibel of the Dana-Farber Cancer Institute at Harvard University told the American Society of Clinical Oncology in Chicago: “The average weight of our citizens is increasing dramatically. “We’ve really got a critical mass of evidence where we see this relationship, the heavier people are more at risk. 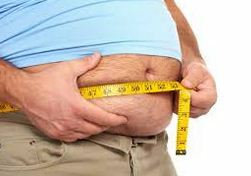 “I think people are aware that being overweight increases the risk of heart disease and diabetes but not that it increases the risk of cancer and their risk of dying from cancer. Smoking is thought to be responsible for a quarter of Britain’s 160,000 annual cancer deaths and Dr Ligibel said obesity could surpass that figure in 10 to 15 years as the population gets fatter while giving up cigarettes. Could robots take over the world? Maybe they will, one day. But the intelligence of robots has just leapt forward in a big way (literally) after scientists created a clever mechanical cheetah that can both see and jump over hurdles. Researchers from Massachusetts Institute of Technology (MIT) say their creation is the world’s first four-legged robot able to run and jump over obstacles at the same time. How does the robotic cheetah work? The ground-breaking robot plans it path like a human runner. As it approaches an obstacle, it guesses the object’s height and distance, working out the best position to jump from while adjusting its stride accordingly. What has the four-legged robot achieved? According to the MIT researchers, the robotic cheetah has cleared hurdles as tall as 18 inches – more than twice its height – while maintaining a speed of 5mph. What do the MIT scientists have to say? Sangbae Kim, assistant professor of mechanical engineering, said: “A running jump is a truly dynamic behaviour. Kim and his colleagues plan to demonstrate the cheetah’s running jump at he DARPA Robotics Challenge in California in June and will present a paper on it in July.